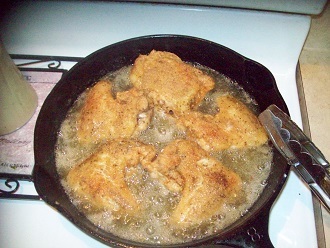 I fry chickens often. Here's how I do it, starting with a whole chicken. Get the chicken out of the packaging. 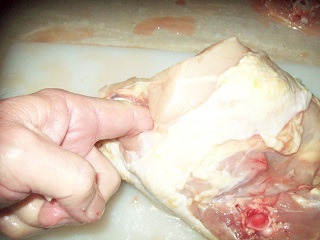 Take the giblets out and rinsr the inside and outside of the chicken with running tap water. 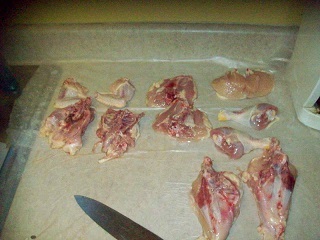 Examine the chicken closely and pull out the feathers that are usually left on them by "modern" processing methods. next post - start the butchery. Start with the wingtips. Those are useless for this application and only make your wing stand up in the pan out of the frying oil. Then do this for the other wing. Take your knife (I use a chef's knife, you use whatever you got but, please, no steak knives, and make a cut straight down, just north of the bone, until you hit another bone. You'll need to cut right at the shoulder on both sides to free the end of this piece. It contains the wishbone, which is attached on the interior of the two shoulder bones, so free the outside first, then delve with your knive on the inside edge of the shoulder bone you've exposed - both sides - and you should be able to lift the piece off. Takes a little practice. Don't be surprised, BTW, if the wishbone is broken - often happens in processing anyway so if you broke it, it's safe to tell your diners that it came that way. Now, with the wishbone removed, turn your attention to the legs. 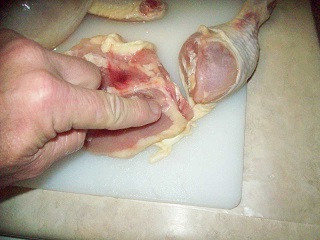 I use that cut to guide me when I'm cutting the skin loose from the thogh. 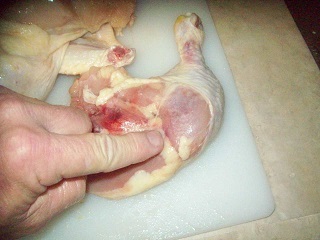 Here I show you to hold the leg quarter up to reveal where to make those cuts I just mentioned. 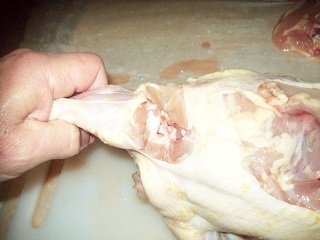 After the skin is freed, you should simply bend the leg quarter backwards, freeing the hip joint. Break the thigh bone out, then get the knife behind it and cut the rest of the way through. Repeat for the other leg quarter. 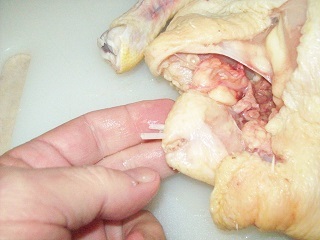 Put your knife just on the drumstick side of that line, and you should be able to cut clean through the joint without hitting bone. Repeat with the other leg quarter. 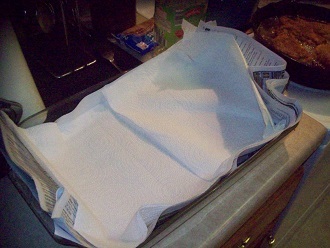 I should say right now that I have part of my counter covered with wax paper to receive the chicket pieces. I always lay them skin side down. I can explain why later - right now I'm in a hurry. I need to finish this thing before the boy wakes up from his nap. 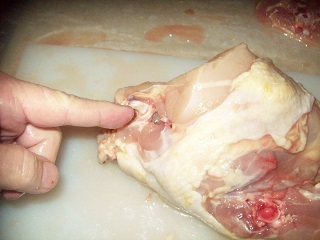 You need to cut the wing off starting at the chicken's armpit, dot the front of the wing. 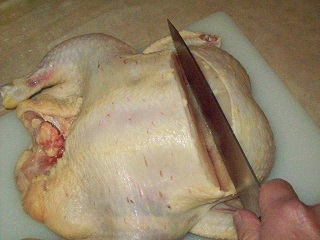 Once you've done that, you should be able to work your knife in there and free up the rest of the wing. 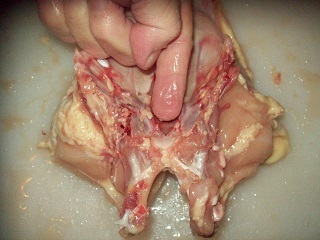 Several bones meet at this point, so use your eyes and the knife tip to try and cut through only the cartilage. 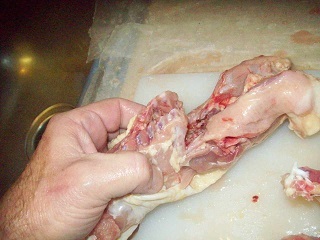 Then cut through the skin on the other side. 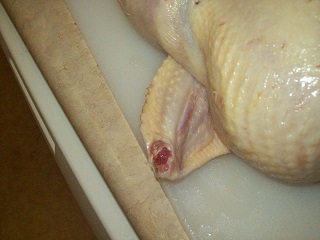 If you want, you can fancy up your wing by cutting a piece of breast off with it when you do that. 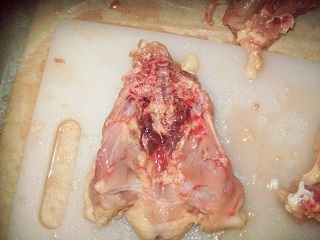 With the carcass laying on it's side, look at where you made that first cut in the armpit. This opens the hole up some so you can get your knife in there. 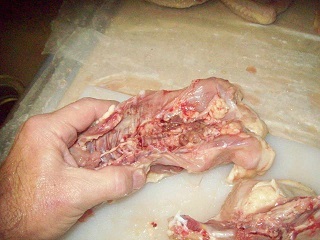 The front and back ribs are joined by cartilage on a chicken, and are not single rib bones, which makes this easier. If you iss this line of cartilage between the two sets of ribs, it's okay. The ribs are delicate and you can cut through them. 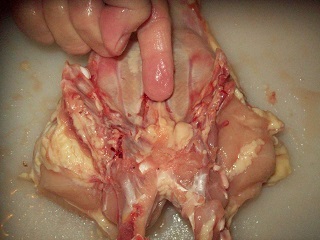 Just go slowly here so you don't drag the ribcage out of the chicken. Then, take a look at the other side from the inside, now that you can, and see the cartilage connections I was talking about that you were supposed to cut through. 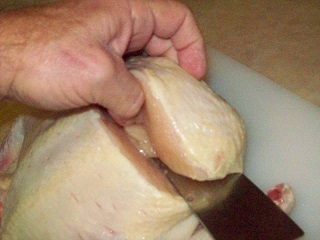 You are ready to separate the breasts from the backs. I just bend them backwards and pull them apart. But if you did a poor job on the wishbone or the wings, you might still have some connections there that you'll need to cut through. Once you do this, you should be able to separate these two back pieces by bending them together (skin side out) until the backbone separates. You might have to cut through the gap formed in the backbone to finish it off. See that red stuff? You might want to scoop it out. I never do unless it smells bad, but I like to live dangerously. The kidneys are in there (which I like.) But kidneys could contain some buildup of whatever in the hell they feed these modern giant fryers so make your own choice here. 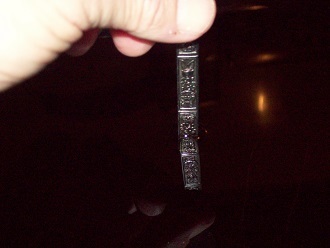 Note the tail at the bottom of the piece. This is called "the Pope's nose." It's one of my favorite things and the main reason I always start with whole chickens. That's where you'll make your next cut. The cut is unnecessary if you're going to leave the breast bone (aka keelbone) in, which I always do. It provides support for the piece when I'm turning it in the pan. Also helps keep the breast moist. I include it here for good reason though. 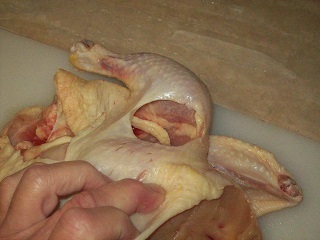 Once this cut is made, you can work your fingers around each side of the keelbone (that red bone in the center of the pic,) spread the two sides apart a little, and lift the keelbone and attached cartilage right out of the breasts. Easy peasy and good to know if you're trying to get some boneless breasts. 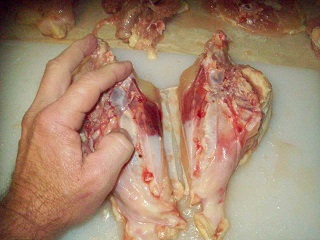 Once you do that, you can simply pull out the little bones in the sides of the breasts, though you will have a little trouble removing the bones in the shoulders. Then, voila! 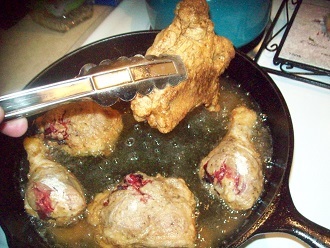 SKIN ON boneless breasts. Handy for chicken Kiev, etc. This is the way my Mama always did it, so I like it. 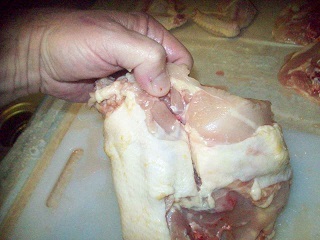 Plus, the breast are a little smaller because the wishbone piece was removed, making for a better pan fit when frying. I do all the above in about 5 minutes time. You might take a little longer, but after a few chcikens you'll be as fast as me. This method is actually quick and simple. It just seems long because of the format required in this forum. As you can see, this day I did two chickens. 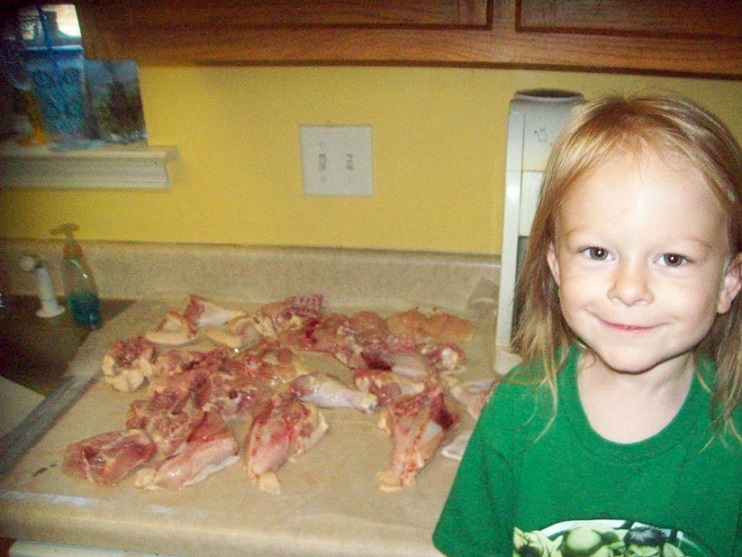 Now that you've done the butchering, you're ready for the next step - seasoning. Yeah, I know everyone says season your flour. Well, I'm not everyone. 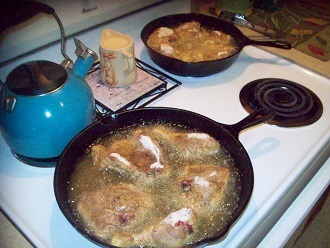 When I fry chicken, I fry a lot of chicken. 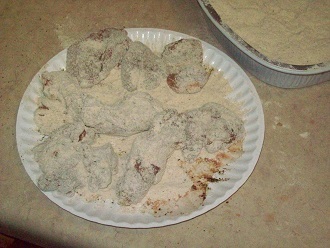 Sometimes I run out of chicken before I run out of seasoned flour. This is not a tragedy, but it is a pain to get out more flour and seasoning with raw chicken and caked-on wet flour all over your fingers. You have to wash first, then dirty up your fingers all over again. 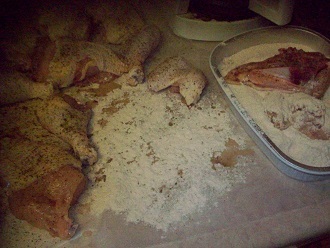 So, what I do is season BOTH the chicken AND the flour. 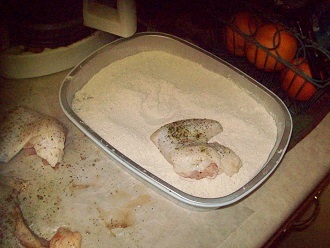 That way, if I'm low on the breading, I can maybe dump a little more flour in carefully without washing up first. I used to use several different ones, like onion powder, garlic powder, maybe some thyme, etc, but I found this stuff - Cavender's (claims to be Greek, but Cavenders is not a Greek name.) That's some good stuff right there and now I use it on practically everything (meatwise) that I cook. The others are salt and pepper - though the Cavenders has plenty of salt already. I haven't used pre-ground pepper in over 30 years, BTW. I mentioned I lay the pieces skin side down. This is to help ensure that the skin side has plenty of liquid on it because I want the breading to stick. 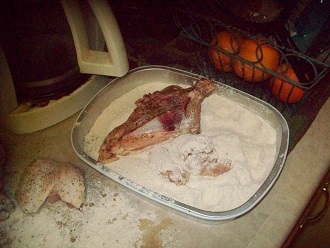 So, I season the skinless side, then flip and season the skin side, then immediately start breading. I put the flour in a pan and season it well - but I don't use Cavenders here unless I'm in a hurry because it's more expensive. Usually, I'll use a couple or three tablespoons of onion powder, about half that much garlic powder, a tablespoon or two of fresh black pepper and a bunch of salt. Too much salt? Doubt it. Go taste the Colonel's original style if you want to know what too much salt is like. My pan holds more than a couple of small pieces. I have two of those pans, both have cheap plastic lids. They are meant to be disposable, but I've been using them (exclusively for various breadings) for a couple of years now no problem. I got tired of using the smaller containers I had. Once all the chicken is breaded, you can start frying. But, if you got an early enough start, you can let it rest 20-30 minutes. You'll find that the liquid on the chicken has soaked through the breading. This is a good thing. You can then re-bread the pieces for an extra crunchy coating. Speaking of pans, I use cast iron exclusively. Use it and you'll find out why. I've got 5 skillets, two smallish (10 in) two medium (12 in) and one huge one that won't fit on any burner I have. I'd love to use the two 12 inch pans, but my wife bought this stove when I was at work and it only has one big burner. She doesn't consider much beyond price when she makes a purchase. Except when she's buying beer. So, here's a 12 inch and a 10 inch skillet on two different sized burners, making this a tricky job for me. Hope you have a better setup. Both skillets have the same level of canola oil in them - about an inch, maybe a little less. 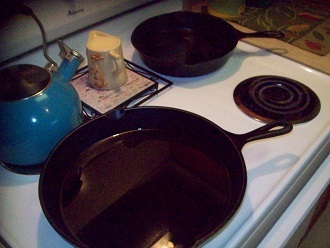 I pre-heat the oil in the pans. Look at the surface at an angle to see the glare from an overhead light. When the surface appears to be roiling, you're ready to fry. This is sort of an iffy proposition, so feel free to use a thermometer. You need at least 365 degrees, but no more than 370. For about 10 to 15 minutes. This is what some consider to be weird. 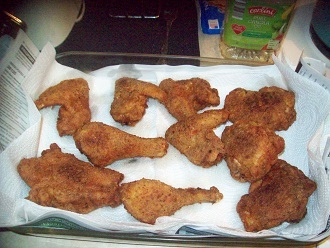 I fry for 7 minutes on a side, five times for dark meat and 4 times for white. I use a timer and flip the pieces right on time. You can see here that I let my oil get a little too warm. This is why the 7 minutes. In case I've screwed up, I can catch it before it goes too far. Once seven minutes has passed, the oil isn't gonna be too hot anymore. 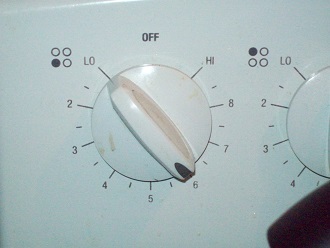 But if you get too dark a color, you can ease the temp down a little once you flip the pieces. After all, it's only seven minutes and you can adjust later if needed. Skin side down is fried first. The skin is the "presentation side," so you want the pan to be pristine on the first fry of that side. That's the smaller pan. The other pic is the larger one. The steps above are repeated. Remember - 7 minutes per side 4 times (in other words, two fryings each side) for white meat and 5 times (three fryings for the skin side, two for the other side) for dark. That might be a little overcooked, but it helps me with catching mistakes like I said, and it makes the breading crispier too. Most recipes will tell you 25 minutes or so. That's about what I do white meat for (28 minutes,) but I do the dark for 35. It's done before then though, if you're in a hurry. 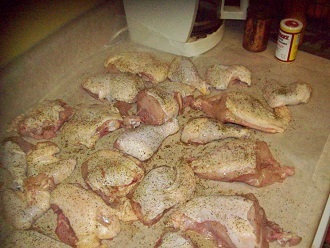 I fry a lot of chicken, so it has to go somewhere to make room for the next batch. And then into the oven until the next batch is ready. I've come to realize that this resting period in the hot oven is good for two things (other than, obviously, keeping the chicken warm.) 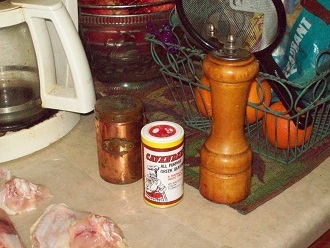 It makes the chicken crispier, and the heat helps remove more of the oil from the chicken. There IS somewhat of a trick to it, but you can manage it without the tricks if you so desire. I'm really impressed, Harte... You actually watched and learned from your mom when she was doing all that stuff. Looking back, I really wish that I had. She always amazed me with her speed in doing this, mixing up a dip and flour mixture to dust it with before dropping it in grease that was the PERFECT temp to make it crispy.